WHAT TO DO WHEN THE FUD FACTOR IS BLOCKING YOUR ABUNDANCE? The old “FUD Factor” (Fear, Uncertainty, and Doubt) can hit any of us at any time. Here’s a way to deal with that. Today take time to LISTEN deeply to the whispers of your heart. They have a message for you that will guide you to true PROSPERITY in whatever area or areas of your life you truly desire . Take time today to IMAGINE your life and make a list of everything you desire. Currently I am in a 60 day mentoring group to fast track my business to 6 figures. I give myself permission to have everything I desire. I give myself permission to ……. I can already hear you wondering: can I really have it all? You have to believe first. Fully embrace what your heart is whispering and then imagine yourself in the picture. I know your old “friend” FUD might have dropped in for a visit, reminding you you are not good enough, you don’t want to change, and the excuses go on. I know I have hard on my mindset work to overcome that Fear, Uncertainty, and Doubt. Please share yours in the comments. I am excited to read your abundance list. If you want to know more about how you can live your abundant life, I am here to support you. Just PM me or comment abundant life below. What Did My Heart Want Me To Know Today? Then shuffled and I drew 3 cards from my Heart Whisper Daily Guidance Oracle Deck. “When you follow one path prosperity will flow”. What will Power me forward today? being able to bounce back when I feel totally let down, yes even by a trusted friend or colleague- happened at the weekend! I start each day in gratitude when I wake and then I journal and from today I will use my gratitude rock each night to be thankful for at least one thing from my day, so I fall asleep in the arms of gratitude. I used to always journal at night, recently added it to my morning journaling. What are you grateful for today? Does gratitude empower you? feelings of joy love and freedom. I have been having a no phone Internet policy till after I have done all my morning rituals which usually includes my walk on the beach. I discovered I was one of the winners of Denise Wakeman’s 5 day instastory challenge wow I was feeling so blessed. A few weeks ago I had been gifted, a reading from Cheryl Hart, another random draw. The manifesting muscle is working well. This reading from Cheryl and my guides was very important, you might even say a pivoting point. I will be writing more about this tomorrow. Now I am here at the beach. the Azure of the Sea which is quite flat today freat for me to do my exercises in rather than in the pool. a walk on the abundance of soft clean sand. What do my guides have to whisper to me today? comes when you know you are enough, more than enough. the doors to abundance do open as you are ready to receive. Then you move closer to having the Radiant Health, Financial Freedom and Inner Peace that you desire. This is perfect for me today. Does this reading and today’s prompt speak to you? Share in the comments what the abundance you now have in your life is bringing you today. What Brings Healing Power to ME today? Maybe it will speak to your heart and your own healing. This healing does not just have to be for your body and your health, it can be for your relationship/s, you finances, business, spiritual life and more. Often two or more are intertwined as I discovered when I looked up Louise Hay’s You can heal your Life on sciatica: Being hypocritical. Fear of money! “I move into my greater good. My good is is everywhere and I am secure and safe. Then I checked in Inna Segal’s The Secret Language of your Body: She Talk about feeling stuck, being worried about survival. not feeling good enough, stifling of creativity and more! Yes it did speak to me as I had been taking a much closer look at my business and the profitability of it . RECEIVE all the love that is you and surrounds you! Then the ABUNDANCE will flow in as in letting go you are releasing all thoughts of lack. When you release all thoughts of lack, of not being enough, abundance flows. ARE YOUR DREAMS EMPOWERING YOU NOW! FOCUSING ON MY DREAMS EMPOWERS ME DAILY! I woke early today and the feeling I had was one of how will I get everything done, do I really want to be doing what I have mapped out for November? You know that one? I keep coming back to I just want to do my art! Then I saw I had been accepted into a new accountability group No limitation November. My energy immediately shifted and I felt a Hell YES I can do this. Remember Suzie your purpose is to empower, color and heal the world through the power of love. The card today is DREAM BIG. So apt! Yes that’s where you are going towards your dreams. Be very careful that you don’t get sidetracked by listening to too many mentors! Now I am going to paint. What will you do today that will move your closer to your dreams? I am prospering on my path to true ABUNDANCE. I am following the path of my heart, being me and sharing of and from my heart. I am in flow and fully aligned. I am going to keep adding to this list each day then I will stay a line to the path of abundance and prosperity through the power of love, fully accepting me. What does your being fully aligned life look feel and sound like? What does my heart want me to know today? This was the question I asked myself. Yes just be you, stop trying to be all things to all people, like you think you should be! You still need clarity on who you are when you just be you. Sit in stillness and allow your inner wisdom, your heart whispers to guide you. Allow the one thing that will propel you forward to surface. The next words I wrote were loving you fully. Do you really love you unconditionally? When I was lying in bed this morning after saying my prayers. doing ho’oponopono and giving thanks, I heard Suzie you must fully love you! Wow that was a shock. I do the daily work and feel I do love myself unconditionally. Looks like still a few edges to sharpen! Go back and do the mirror work yes you can stand in front of a mirror and say and feel: Suzie I love you, I really love you and I do repeat it throughout the day. I meditated and allowed my guides to come through. “ know that love heals when you truly love yourself, you know must show others this is the way. I will be here to guide you and remind you, just ask. Yes Suzie, I am your new guardian angel”. So I asked and was reminded that I was to do her 21 day Mirror Work course. I had recommended it to others. From this I will develop a Power of love course that brings in new mirror work that will emerge as I do her course, exciting and a bit scary- how do I fit this in? Let go of the how Suzie! Des and Kat keep reminding me of this. Well yes, it is part of opening your heart to love, and daring to dream again. I will do a series of Circle of Love paintings that I got a message about a week or so ago. This will open some windows of the heart and soul for this new course. This is the first one in this series of 7. A 3 layer watercolor on 300gsm watercolor paper. Yes it is for sale- it will come ready to frame. My heart is smiling and I can feel the excitement. Yes Suzie remember to just be and ask. What Does Your Heart Want Your To Know Today? ON MY WAY To My Millionaire Life. Today’s question is in response to a challenge from my mentor to journal on after the last class in Get Famous Being YOU. The past 4 weeks of this training have rocked me, caused meltdowns, lots of resistance and yesterday was the same. I started questioning myself, could I really uplevel me, my life and my business. I talked with Des who thought I should tackle the journaling question- I decided to put it aside, cooked dinner- a great escape for me. Then decided on an early night. Saying I think a week away from Social Media was what I needed to breakthrough. What does the vision for the future you and your life look like? I love that I drew the freedom card. Freedom is what drives me, freedom is one of my main values so having that come up was wonderful. Then I asked myself: What is the vision you have Suzie for the future you and your future life? So now I have a conversation with me (SC) and my inner wisdom (IW). I must ask IW what his or her name is too. This was a practise I developed when I was doing my masters degree and a topic called Imagination in Action. I used subconscious then rather than Inner Wisdom. IW: First you will be painting each day and be a successful artist who sells her work each day. That means start today! SC: Okay I have got that. Luckily, I decluttered my studio and have it ready to video and start to paint in. IW: Yes, you have been avoiding that. Remember what I am telling you now is the future you. 🙂 You video as you paint from your bright area studio in your new spacious four-bedroom apartment maybe a townhouse near the beach. So, from now you must step up and into the artist you were born to be. You will use your art to open people’s hearts and your products and programs will reflect how color heals people to love themselves unconditionally. You do empower through color and your words, your cards, your books your speaking and your art. Your Creative Now program grew from the Empowering You and Dare to Dream Again programs. You have finally fully loved yourself and have stepped into your creative power. Suzie’s Healing Journey was the final piece in the puzzle that set you free.You now live a laptop lifestyle, free of all debt and doubts. Des and you are speakers on shows, podcasts and stages around the world telling the story of your journey. Reminding people that you are never too late to Dare to Dream again. You now live a first-class lifestyle. Your home reflects this in color and style. You have like-minded friend’s clients and colleagues who you spend time with that is mutually empowering. You travel each month for work and pleasure. Holidays are just part of working and you love it. You have both given TED Talks that have millions of views, inspired so many people as you became inspired by listening before to TED talks to inspire and motivate you. You now make a million dollars each year from your art, your books, apps, your speaking, oracle cards, print on demand and you still do heartscapes for special clients that are now treasured works of art on large canvases. Money now flows in daily. You have an investment property again. You bought well this time. You travel first class and now are a millionaire who made a powerful difference to your life and through your message, through your work and your money create change in the world. So now you can have, do and be all that you ever dreamed of and desired. Life is wonderful you love you and your life. You are so happy. SC: Wow that was a download and I sense there is more to come. I am so excited and grateful that I met Kat and she taught me what I already knew: that my message was inside of me and once I embraced that 100%+ my life would change and it has. I had to learn to let go, step back, to step up and think like a millionaire. My millionaire mindset empowered me and made my heart sing as I shared and sold each day. I became the powerful, colorful for millionaire who colors and heals the world through The Power of Love. This is so empowering for me, I feel like I have broken through a huge limiting belief that I have been carrying around for more years than I want to remember. I am now ready to fully embrace my message, my purpose and color and heal the world through love and it feels so freeing. This means doing the work, being consistent and disciplined every day. more that will flow this week as I uplevel me and my life! There it is all laid on the line. I am looking forward to sharing my journey with you over the next year or so on my way to becoming a millionaire. There I have written that from my heart. Do you have a vision for your future you? Remember: Open your heart to LOVE: DARE to DREAM again! Are you ready to create the future you, to dare to dream again? Schedule a call with me to see how I can help uplevel your dreams, color you world so you can heal your life. How will I be aligned today in my journal and then I drew the SMILE card. This is a card I sometimes wonder why I put it in the deck as I often draw it- message there in itself. I woke early and remembered I had forgotten to upgrade a service I use. So I got up and yes went straight to the computer and took action and then went over to my sacred space for journaling and my morning rituals. I wrote I woke early and I am excited about the day ahead as as I have a challenge to announce, a new painting to start plus putting my sales pages together for my art and merchandise. A while later I came to my computer to write this post. Something said to me check the payment went through etc. The transaction was showing in paypal and I then got the nudge check your email. I then, after Des said write down what you want the outcome to be- I taught him so well. I then wrote to support and got the reply you will hear from us within the hour. I decided to go back and read the fine print and discovered I had made a mistake, so composed an email with my options outlined and sent that off. It was then time for a walk and Des commented how positive I was after my initial outburst and complimented me for my bounce back ability. There would have been a time where I would have lost half a day looking at all the options. Today I set my options out in the email and went for the walk. When I returned there was a very positive response, a discount code, if I decided to take up the more expensive plan and they gave me 2 weeks grace to decide if I really want to pay double what I had budgeted for. Today I choose to be positive in who I be, how I am and what I say. I feel my inner critic fall away as I open my heart to love. So instead of holding onto to negativity, I made the switch and was smiling again very quickly. So I had woken with a smile on my face and in gratitude. Not everyone does that. When we were walking we passed a woman who had her head down, eyes to the footpath. We smiled as we do each day at all the people we pass and say good morning. Okay for some people today might have not been a good morning. It was very grey and the rain was just starting again – lightly. The head or the eyes did not move and the face was not smiling. We notice this often especially on the beach. This affirms for me that there is such a big need for the work I do that colors , heals and open hearts to love. What a journey my Heart has brought me through. This speaks volumes of my self-love, my strength, my gifts that I now have found. My heart is full. Bless you Suzie. You have no ideal of the ripple you’ve made and turningit into a wave. Incredible. WILL YOU START THE MONTH IN ALIGNMENT WITH YOUR INTENTIONS? Welcome to a new month and the Heart Whisper Oracle card reading for October. 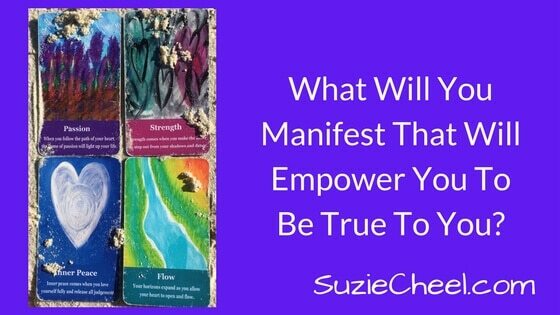 What will this month bring forth that will empower you? Trust your Heart, Trust yourSelf , Trust your Path. I kept shuffling and out flew FREEDOM!- This is the third day in a row the Freedom has appeared. Trust is my word for the year. Freedom is a gift you give yourself when you release fear and spread your wings. This was a most unusual reading for me. I often get one fly card, but not three. Also three that are totally in alignment for me right now. The Action card Yes: “As you say yes to love, to life and to you, your heart whispers “Thank you”. This is another so in alignment card for me. I know that to empower myself in a bigger way I have to only do what I can say a HELL YES to. That is not easy for me as there is always the little Miss Goody Two Shoes voice inside that says- just one more time, etc! This ties all the cards and the messages together. To experience those feeling of joy we must fully love oneself and do the daily work that does empower us. From here I will plan my days for this month. Always asking: am I in alignment, is this a hell yes? Does this reading speak to you? Will you open your heart to allow what will empower you to come in? DO YOU DISAPPOINT YOURSELF, SELF-SABOTAGE? IS IT EASY FOR YOU TO TAKE THE DAILY ACTION THAT MOVES YOU TOWARDS YOUR DREAM? Question:What stops me taking daily action towards my dream? Today’s card is INNER PEACE: Inner peace comes when you love yourself fully and release all judgement. Looking back on the intentions I set back on 2/9/17. I initially got the feeling of sadness and disappointment set in as I read over what I had intended for September. As I have been reading through and typing up my journals for my book Suzie’s Healing Journey – The total path to self-love, I can see the pattern. I set myself so many things to do on a daily basis that I continually set myself up for failure. In choosing not to review daily, I continue to judge myself. I forget to celebrate my wins. Wow what A big wake up call I got this morning. There is also a blessing here as my soulmate and beach coach Des is my sounding board for mornings like this. As we got to the beach Des said you have something to share? Most morning this month I have shared the lesson I have learned from doing this 30 day Eft program. Des often add to or reminds me of where I am being hard on myself- making unnecessary judgement. Today I shared my experience and my feeling from earlier this morning. This was early as today I woke up at 4.04 and then was with my journal, my altar, my cards, etc by 4.30 am. I was then able to talk out how I was able to see the pattern and it has been going on for longer than I want to remember. Yesterday when I was recording from my journal for my Book Lucky To Be Alive-How i used The Law of Attraction and the power of Self Love to save my life I took a photo of a to do list I had written in my journal, when my work was healing. When I read through the list that only had a few items checked off. Who knows? I may have done more, reviewing my day, although I do have it on my daily list and so often end the day without checking it off. I even have a colourful what I call my to love list that I sometimes find myself filling in the next morning. I just remembered I can use my mobile to check things off that I could quickly do each evening. I would be acknowledging myself and celebrating what I have done! I would be looking at what is in alignment , can be actioned tomorrow and discarding what isn’t aligned to my purpose, my message. This means putting my purpose and passion first. It’s also about putting me first! I thought I was. I do all the daily self-care work. There is a missing link. Now what will I choose to change? I said to Des: “I write out my intentions early in the month and choose to leave those pages rarely referred back to. I now know that I am going to choose to write these intentions out daily in my morning journal. Then my inner self will be smiling. I am painting, creating, speaking, writing, travelling the world and living a laptop lifestyle. With a base here in Australia, near the beach. I choose to be aligned to my passion and purpose every day, being open to all the opportunities that are coming to me. These bring ripples of love, change and freedom on all levels. I open heart to love, I am financially free, I dared to dream again! I now have this printed out, pasted into my journal, on the board behind my computer screen and on my phone. When I set my intentions for the next 90 days this weekend, this will be the focus from which I plan. I will be checking back on the 24 intentions I set for faith, fitness, finance and family. I will be looking at where the priority is, asking what areas need more focus. I have great daily habits for my faith (spirituality) my health and fitness that I do daily without fail. My family/relationships I am happy with at this time. I will be reducing the number of new intentions in these areas for the next 90 days. The areas that I will be focusing on is my mission, my message, my business and my clients. I am putting this to the front foot. I will be checking in before I say yes– is this aligned with my purpose, why I am here? Inner peace comes when you love yourself fully and release all judgement. Will I be feeling good? YES. I will be asking each day is this a Hell Yes or a Hell NO? I will become more aligned each day. I will be shining my light, move step my step towards living the life I really want and desire. Ready to dare to dream again? I love helping heart centred spirited women get clarity on your purpose. If you think I might be the coach for you why not book a FREE discovery call today?